John Legend and Chrissy Teigen addressed the House Democrats’ annual issues conference on Wednesday night. At one point, Teigen slammed Ivanka Trump for posting pictures of her children amid the Trump administration’s family separation policy for migrants seeking asylum at the US-Mexico border. 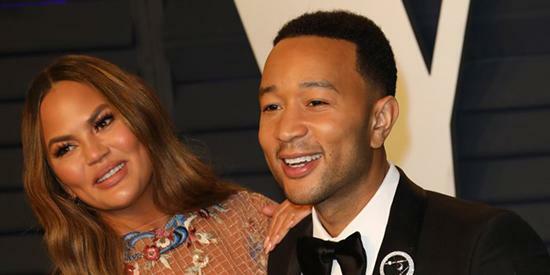 LEESBURG, Virginia — The major celebrity couple in musician John Legend and supermodel Chrissy Teigen addressed a collective of Democratic lawmakers on Wednesday. The couple took the stage during a brief appearance at the annual issues conference for the House Democratic Caucus. The power couple spoke on several different topics, ranging from the serious to some lighthearted comedy. Legend at one point quipped that Teigen was mocking President Donald Trump long before his political ascent. Members of the press were only allowed in the room for a portion of their remarks, which was part of a Q&A hosted by former MSNBC host Melissa Harris-Perry. Legend called on Democrats to pass big-ticket legislation, calling it “critical,” in addition to investigating and probing Trump and his administration. During a portion of the panel, Teigen took a shot at Ivanka Trump, a current White House adviser and daughter of the president. Teigen took issue with the administration’s stances, especially as it relates to the Department of Homeland Security’s policy that has resulted in family separations at the US-Mexico border. As part of the Trump administration’s “zero-tolerance” immigration policy, first implemented by the former Attorney General Jeff Sessions in April 2018, some families who had arrived at the US-Mexico border were detained and their children were taken from them and sent to detention centers around the country. “There are children that are completely — honestly I cannot fathom for a second how scared our children would be if they were without us,” Teigen said. A spokesperson for the White House was not immediately available for comment. Teigen and Legend are both active Democrats. And Legend has participated in events with former President Barack Obama and donated to his 2012 reelection campaign. Previous articleSplitting heirs: what’s behind Harry and William’s separating households?